Collapse of brain: The collapse of the cortical mantle and subdural collections are the most common complications after surgery for tumors in the lateral ventricles, especially in patients with significant hydrocephalus and voluminous mass lesions (13, 25, 30, 47). The resulting subdural collections can persist and require such surgical treatment as subdural taps or a subdural- peritoneal shunt (30, 47). Prevention: Irrigation, filling the ventricles with saline solution, insertion of subdural drain and/or ventricular catheter for 48-72 hours. Glue sealing of the cortical edges (25, 30). Treatment: Subdural taps, subdural-peritoneal shunt. MRI after resection of bilateral choroid plexus papilloma: Bilateral subdural collection after total removal of both lesions. Follow-up MRI: Resolution of bilateral subdural collection after unilateral subdural-peritoneal shunting. MRI showing choroid plexus papillomas bilaterally: Preoperative MRI. Postoperative MRI for patient whose preoperative scan is shown on the left: Bilateral subdural collection are present after total removal of both lesions. Follow-up MRI for same patient shown to left: Shown is a resolution of the bilateral subdural collections after placement of a right-sided subdural-peritoneal shunt. 10–59% incidence: Persistent hydrocephalus may be present even after successful removal of intraventricular tumors, and the incidence of hydrocephalus requiring shunts varies from 10–50%. 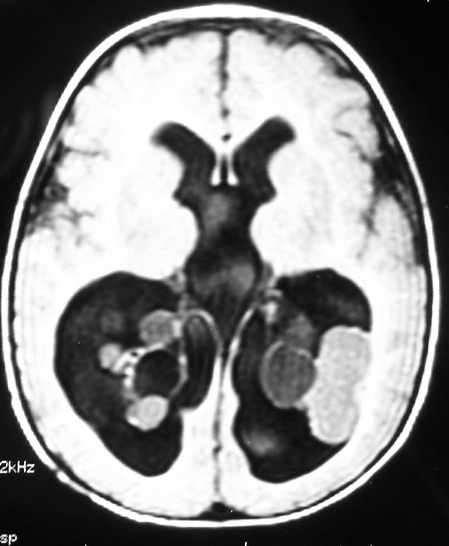 Most cases are seen in patients harboring choroid plexus papilloma (2, 11, 38). 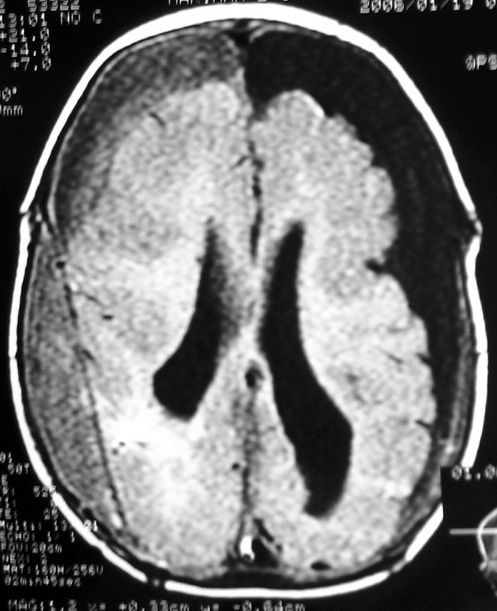 This is often communicating hydrocephalus due to functional obstruction at the level of arachnoid granulations (30). Prevention: Exhaustive irrigation with saline solution. Removal of debris and air inside the ventricles (18). Fever with headache and neck stiffness: Chemical meningitis usually courses with low fever, headache, and neck stiffness. It is due to irritation caused by blood inside the ventricles. Venous congestion and retraction injuries: Excessive retraction and lesion of venous structures may result in brain edema, one of the most common postoperative complications. Treatment: Osmotic diuretics, steroids, external ventricular drainage. 10% incidence: Intraventricular hemorrhage may complicate 10% of the surgical procedures inside the lateral ventricles, and some patients may require reoperation (13, 47). Treatment: Symptomatic. Occasionally this can cause hydrocephalus that may require treatment. The surgical approach used determines the specific risks for postoperative neurological deficits. Visual deficits: Homonymous hemianopsia related to optic pathways injury can occur with temporal, parietal, and occipital approaches to the lateral ventricle (8, 14, 31, 32). While approaching the third ventricle through the occipital transtentorial approach, improper positioning of the retractor over the mesial occipital lobe may result in visual field defect (8). Seizures: Epilepsy is associated with the frontal transcortical approaches to the lateral and third ventricles (14, 45). Weakness: Contralateral hemiplegia related to the placement of retractors over the motor area, supplementary motor area, or internal capsule can occur transiently. Permanent motor deficit occurs in 30% of the patients (31, 32). This is typically due to venous infarction of the anterior portion of one or both cerebral hemispheres because of the occlusion of draining veins from the brain to the sagittal sinus (38). Cognitive deficits: Problems with memory can be related to lesions around the foramen of Monro and fornix (3, 4, 46). Language deficits can also occur in 10-30% of patients after cortical approaches to the lateral ventricle (31, 32). Confabulation, aphasia, and astereognosis are associated with transcallosal approaches (10). Mutism may be related to bilateral cingulate gyrus retraction (10). Cerebral disconnection syndrome is usually described in association with injuries of the splenium and body of the corpus callosum. Surgical mortality rate low: The current operative mortality rate is less than 10% (2, 13, 24, 47). Young patients with highly vascular tumors such as choroid plexus papillomas or carcinomas are at highest risk (24, 30, 47).